I’m a scrambled person myself – mostly because they are dead-easy to make. A little pepper, a lot of salt, and buttery, buttery toast. Bacon is preferred, but not necessary. During the Thanksgiving holiday I remembered a steamed egg thing from notmartha that seemed like a good thing to have. Normally soft-yolked eggs ick me out, but this wasn’t too gooey. Basically you put an egg on a steamer in a pot of water with a little water, put on the lid, set a timer for 11 minutes, then turn the heat on high. When Lloyd and I were in choir in college we toured Germany for several weeks. 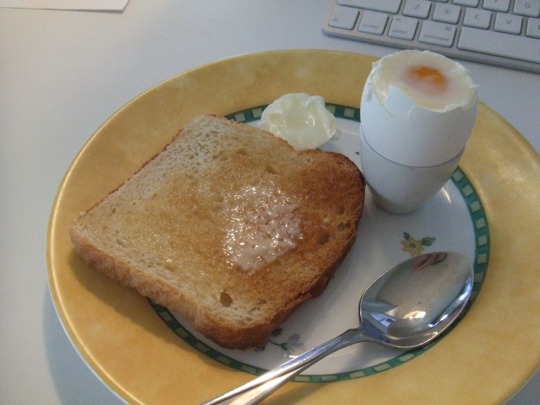 Our choir would be hosted by wonderful families, and often we’d be served soft-boiled eggs for breakfast. I liked to watch the masters at egg-twhacking. Basically you hold the egg steady in the cup then thwack it with a very sharp knife. If you’re good at it the whole top of the egg comes off in one swoop. If you’re bad at it then you eat a lot of shell. I eat a lot of shell. I like them fried over easy, but over medium heat, so the whites are set but not at all crispy, and the yolks are cooked a little tiny bit around the edges. Fresh pepper, a little salt, rosemary bread toast with butter, and o.j. My favorite meal, really. I like eggs cooked pretty much any way. I scramble eggs most of the time because it is easy and fast. Plus you can through pretty much anything in there. But my favorite is deviled eggs. I need to find a potluck. P.S. -- I have started using the steamed method recently too and love it! I only cook it for 8 minutes for truly soft yolks. Not Martha’s eleven minutes made mine rock hard. Ha! I have seen that before and wanted to buy it, but the cost per use would be astronomic. Thanks for the link!